Cloud, a 2 year, indoor-outdoor intact male cat, was presented to us for a large laceration on his left forearm. 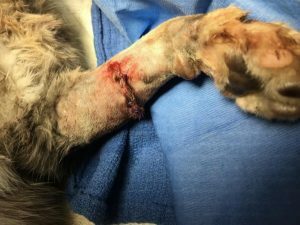 He went outside for several hours, when he returned was bleeding profusely from his arm. His owners are unsure how he acquired the wound. 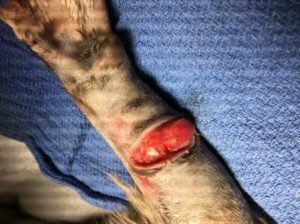 On presentation, Cloud had a very large laceration on his forearm that extend past the skin and through the underlying musculature. The remainder of his physical exam was within normal limits. 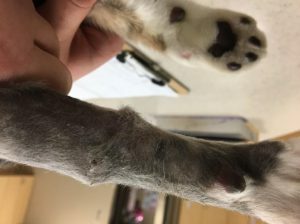 An x-ray was taken, and the wound did not extend to the underlying bone. Cloud was sedated and the wound was thoroughly clean. The wound needed to be closed in several layers. First the musculature needed to be sutured together. Then the overlying fascia closed, and finally the skin layer was closed. There was a moderate amount of inflammation following closure. 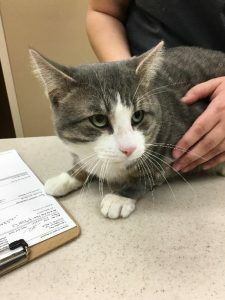 Cloud was given an injection of pain medications and antibiotics. We discharge cloud to his owners. There was some concern about how well that Cloud would heal. Because the laceration was so deep we were unsure if the nervous tissue had been affected. Also because the muscles of the forearms were almost completely transected, we were unsure if Cloud would have any long term mobility issues. However, luckily, over the following 2 weeks, Cloud healed very well, and suffered no long term consequences from his wounds.